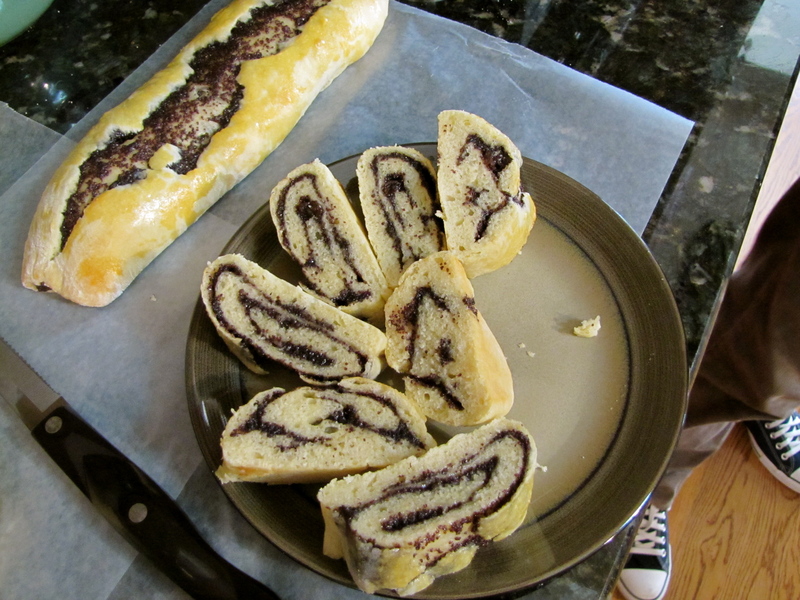 We’re now going to travel to a little town in Poland where James’ (paternal) great-great grandmother, Anna Butenas Yesenofski, born in 1886, made poppyseed rolls. 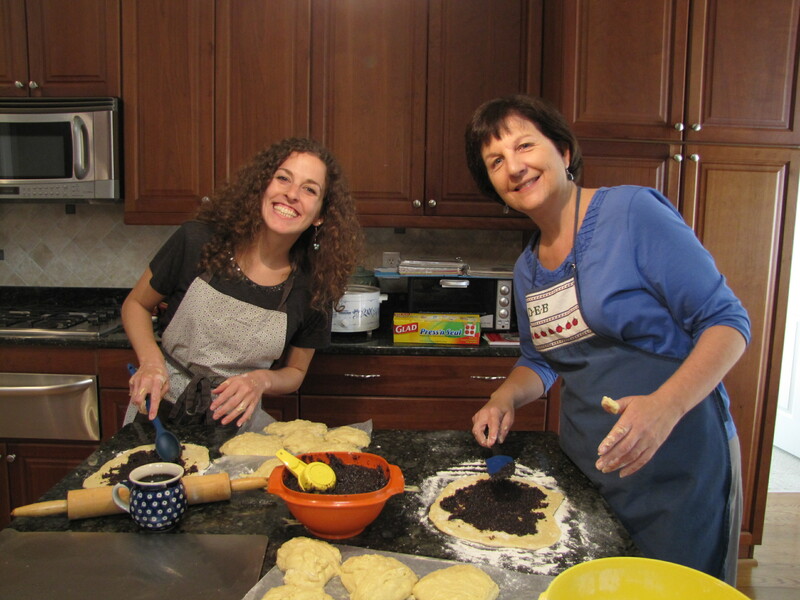 Anna brought the recipe with her from Poland when when she sailed for America alone in 1904! This recipe got passed down the line to James’ mom; and just this weekend James’ mom passed it on to me. Do you realize what that means? This recipe has been passed down and baked for more than 107+ years! Talk about tradition! (note: the recipe below has been adapted overtime for 20th and 21st century bakers). Ever since I started celebrating the holidays with James’ family, poppyseed rolls and Kotecki Krunch have been part of the festivities. I’m so excited to now be part of this tradition! My favorite part of this recipe is Direction #14. Rollin' and shmearin' poppyseed fillin'! 1. Melt butter in a very large pan, then turn off heat. 2. Add all other ingredients (except filling) one at a time, mixing well after each. 3. Knead a little right in the pan. 4. Cover pan with a towel and allow to rise 4 hours in a non-drafty/warm spot. 5. Knead a little again in the pan, adding flour as needed. As Grandma K says “Remember, you can’t hurt that dough…use as much flour as you need to so it rolls out easily without sticking”. 7. Separate dough into 16 balls. 8. Sprinkle flour on smooth clean surface and roll out one dough ball at a time to approximately 8×6″ rectangle….not too thin….flour sprinkled when needed as you go. 9. Spread with a generous 1/4 cup of poppyseed filling, mixed with some raisins if desired, and spread to the edges gently with plastic spatula or spoon. 10. Starting with the shorter side, roll up and place on greased pan, seam side down. Usually you can fit three per cookie sheet….they expand quite a bit as they cook. 12. Bake at approximately 26 minutes, or until golden. Let cool then slice. They’re really good warmed up for 10 seconds in the microwave. 13. Let cool, then you must test for quality control! They freeze very well when wrapped in heavy foil….and make great holiday gifts! 14. Enjoy and share the love! This looks AMAZING. I totally want to try this!